Alcoholism is an addiction to drinking alcohol. Despite the negative effects a person continues to excessively consume alcohol and cannot control the urge. Alcoholism greatly affects the quality of life of the addicted person. Not only the alcohol it depends on the health problems, but it causes personal and social problems. Unlike alcohol abuse, alcohol addiction means that a person compulsively and uncontrollably drinks alcohol. Despite being aware of the harmful effects, an alcoholic cannot break the habit easily due to the physical dependence and usually needs medical help. Alcohol directly affects a person's nervous system. Even though it appears at first that alcohol sparks off ecstatic behavior and stimulates, with continual consumption it decreases cognitive processes, influence on perception and coordination. Intoxicating effects of alcohol damage brain functions. Muscles weaken, speech becomes incomprehensible and thought activities are low. A negative effect of alcohol is also poor judgment and emotional problems. Alcoholism has severe effects on mental abilities and physical performances. 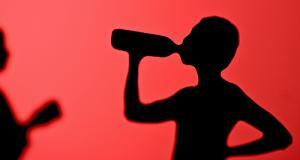 An alcoholic has problems at work, at home, in relationships with people and is likely to commit a criminal offense. Long-term alcohol abuse may lead to panic disorders, depression, anxiety and psychosis and is a prevalent factor for developing dementia. Alcohol dependence impairs a person's health to great extent. The most dominant physical impairment is the cirrhosis of the liver. Excessive consumption of alcohol also causes other health conditions associated with liver, inflammations or alcoholic hepatitis. Alcoholics are at higher risks of developing some gastrointestinal diseases. They suffer from gastritis, irritation of the stomach lining, and experience problems with digestion. Alcohol greatly impairs the pancreas which is important for metabolic processes. Alcohol consumption disrupts the digestion of carbohydrates and proteins that pancreas is responsible for. There is the increased risk of getting a cardiovascular disease and suffer a heart attack. Alcohol increases the blood pressure and also has an effect on glucose. It reduces the level of blood sugar which can be potentially dangerous if a person suffers from diabetes and is treated with insulin to regulate blood sugar. Heavy drinking proves to have a negative effect on reproductive organs causing sexual dysfunction. Women experience irregular menstrual cycles, men have problems with erection. Drinking during pregnancy increases the risk of giving birth to a baby with physical or mental complications. Other complications of longer alcohol consumption include osteoporosis, eyesight problems and cancers. Women addicted to alcohol bear the risk of being diagnosed with the breast cancers later in life. Both men and women can develop colon, liver, throat cancers.